Not Android trivia, either (that would be too easy). We're going to play "Oscar Trivia." So, how are we going to do this? With an app called HyperQuiz, which is made by the sponsor of this contest, Hyperbees. 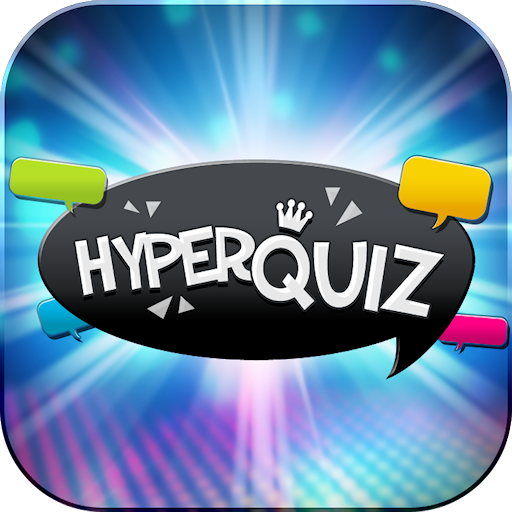 Hyperquiz is a trivia-based game that pits you against three other live players in a race to answer to questions correctly in the least amount of time, so you have to be quick on your feet. In 'Classic' game mode, you face a wide variety of questions across a broad range of topics, which makes the game both challenging and addictive. For this contest, however, you'll be playing in 'Contest' mode, which features all new questions that have never been used in the game before. Remember, you're playing against real people, so answer quickly and correctly to maximize your points! Congratulations, Jacques! You will be contacted shortly for your information. The fifty runners-up will also be awarded in-game currency (Creds), so just because you didn't hit the jackpot, doesn't mean you're walking away empty-handed. Everyone else - keep participating and stay tuned to Android Police so that you don't miss our upcoming giveaway announcements. You can follow AP on Twitter,Facebook, Google+, and RSS. Thanks for playing! 1. The contest starts on Friday 24 February 2012 at 2:00 PM CST / 8:00 PM UTC and ends on Saturday 25 February 2012 at 11:59 PM CST / Sunday 26 February 6:00 AM UTC. 2. 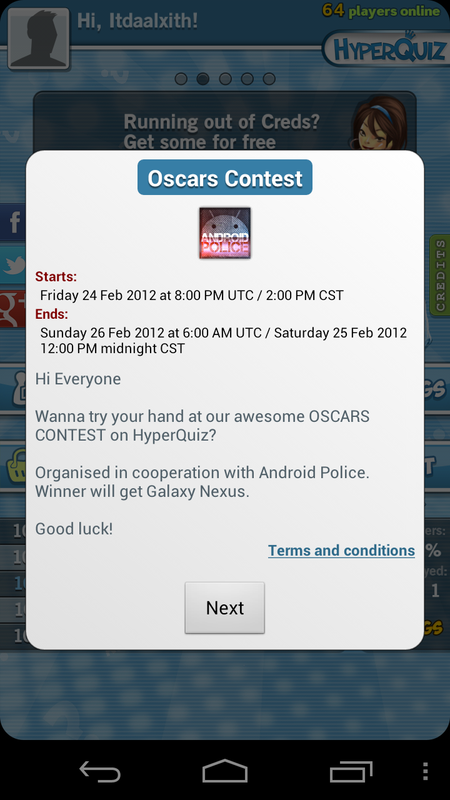 The first prize is a Samsung Galaxy Nexus smartphone, Places from first to fiftieth will be rewarded with HyperQuiz in-game currency, Creds. 3. 2 points will be awarded to every player for each correct answer and 1 additional point to whoever answered correctly and was the fastest. In each game, after the points for answers are tallied, the player with the highest score will get 15 bonus points, the player with the second highest score will get 10 bonus points, and the player with the third highest score will get 5 bonus points. 4. The player with the highest score in the overall Contest wins. There is no limit to the number of games played by a single player. If there is more than one winner with the same score, a play-off match will be organized. 5. Internet access is required, using Wi-Fi is recommended. Please note that the organizers are not responsible for any internet connection problems. 6. 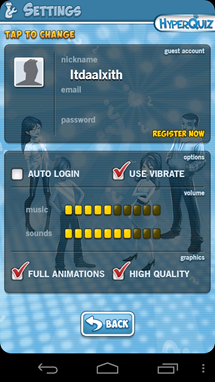 The results can be checked live online in the game. The final official results will be announced on Sunday 25 Feb 2012 on AndroidPolice.com, HyperQuiz Facebook page and HyperQuiz Google+ page. 7. The winners are required to register with HyperQuiz with a valid email address to be able to collect their prizes. You read all of that, right? If not, go do it. That stuff's important. Got it? Great. You're almost ready to play; but first, you need to do a couple of other things. 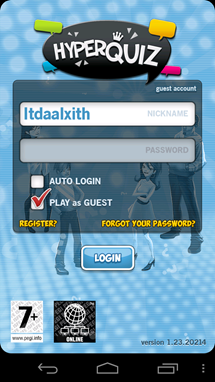 After you open the app, there will be an auto-generated username in the nickname field, and the "Play as Guest" box should be ticked. Go head and hit "login," after that, you're going to create a username and password (we'll need a way to contact you should you win!). 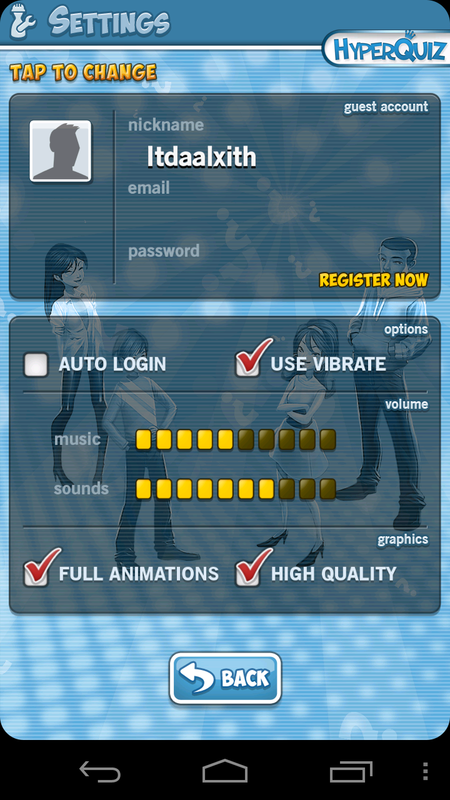 Once "logged in," go ahead a tap the 'Settings' key. 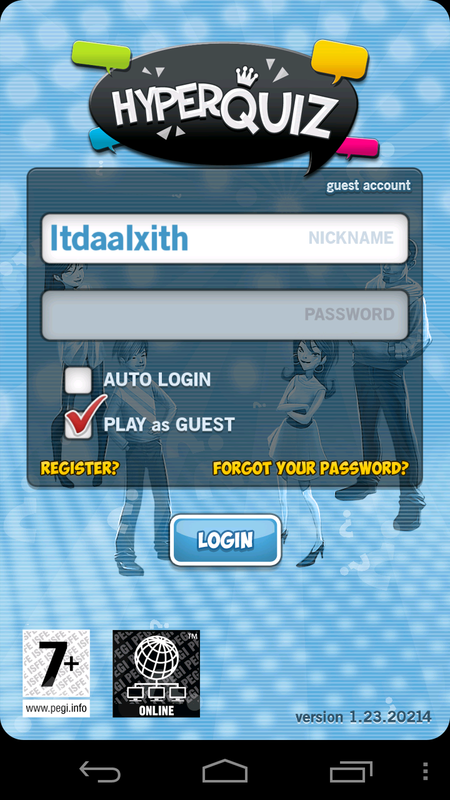 From there, you can create a unique nickname and password. Make sure you sign up with a real email address! Otherwise, we won't be able to let you know if you win! With that out of the way, you're ready to start playing. To get into contest mode, tap the right arrow and hit "Play." You should see the Android Police logo and details about the contest. Hit "Next" and you're ready to go! #Winning. Now that you know how to play, let's talk about the prize. 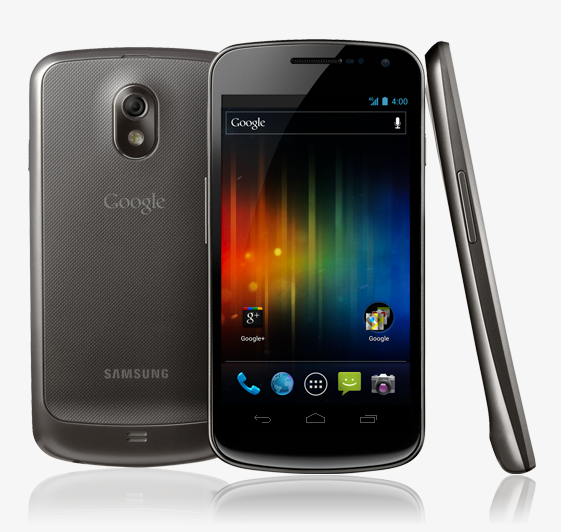 The grand prize winner (read: user with the most points at the end of the 34 hour playing window) will win a shiny new Galaxy Nexus, either unlocked GSM or Verizon LTE - your choice. If you don't win the big-daddy prize, no worries - 14 runners-up will get in-game credits (called Creds) for HyperQuiz, which can be used to access "lifelines" like on Who Wants to be a Millionaire (don't worry, these lifelines have been disabled for the contest - we like to play fair!). The contest starts promptly at 2:00PM CST Today, February 24, 2012 and will end 34 hours later, on Saturday, February 25 at 11:59 PM CST. After that, Hyperbees will let us know who the winner is and we'll send out the notification. This contest is available to users worldwide. ANDROIDPOLICE.COM, A CALIFORNIA SOLE PROPRIETORSHIP (referred to herein as “Contest Provider”) IS THE PROVIDER OF THIS CONTEST. THIS CONTEST IS OPEN ONLY TO RESIDENTS OF THE UNITED STATES, CANADA, MEXICO, CHILE, AUSTRALIA, NEW ZEALAND, SINGAPORE, ISRAEL, INDIA, FRANCE, BELGIUM, THE UNITED KINGDOM, LUXEMBOURG, GERMANY, AUSTRIA, SWITZERLAND, SWEDEN, FINLAND, DENMARK, NORWAY, SPAIN, IRELAND, RUSSIA, THE NETHERLANDS, SOUTH KOREA, SOUTH AFRICA, TAIWAN, ITALY, PORTUGAL, SLOVENIA, ESTONIA, LATVIA, LITHUANIA, ROMANIA, SLOVAKIA, MALAYSIA, VIETNAM, THE PEOPLE'S REPUBLIC OF CHINA, THE CZECH REPUBLIC, CROATIA, THE UKRAINE, POLAND, BULGARIA, AND HUNGARY WHICH ARE OVER THE AGE OF MAJORITY IN THEIR COUNTRY OF RESIDENCE ON THE DATE REFERENCED BELOW AS THE START DATE FOR THE CONTEST ("ENTRANTS"). If you are under the legal age of majority in your country of residence, but are (i) over the age of 13 years of age and a resident of the United States of America, or a member country of the European Union other than Spain, or the United Kingdom; (ii) who is least 14 years of age and a resident of Spain, the United Kingdom, or Russia; or (iii) who is at least 15 years of age and is a resident of the Republic of Korea; one of your parents or legal guardians must submit a signed, written statement that they have read, understood and agree to these Contest rules with your entry, and that such agreement constitutes acceptance of these Contest rules on behalf of you and themselves. All applicable federal, state and local laws and regulations apply. There is no cost to enter or win. Offer void where prohibited. The Contest begins February 24, 2012 at 2:00 PM Central Time and will continue until February 25, 2012 at 11:59 PM Central Time (the "Deadline"). All entries must be received before the Deadline to be eligible to win the Prize. One (1) eligible entrants will be chosen by the Contest Provider as “Winner,” and each will receive a “Prize,” one (1) Samsung Galaxy Nexus, estimated retail value $799.Each winner will be allowed to choose to receive either a Verizon Wireless-compatible Galaxy Nexus, or a global GSM Galaxy Nexus.